The 2016-2017 school year will be my second year teaching Art to the elementary students of Pembroke and I feel so lucky to share the Art room with so many creative, inspiring, silly, and enthusiastic children. It is an absolute honor and a privilege to be introducing art to the youngest learners in the district. 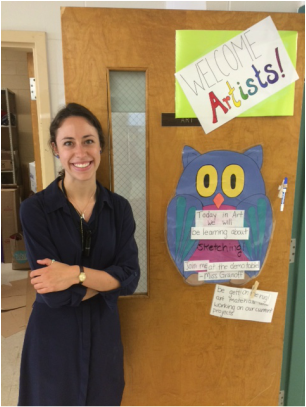 Prior to my first year teaching in Pembroke, I spent the 2014-2015 school year completing my Master of Arts in Teaching through the University of New Hampshire, and student teaching at the Deerfield Community School. I received my Bachelor of Studio Arts at the University of New Hampshire as well, concentrating my coursework in Ceramics and Art Education. I look forward to the art adventures we'll have at Hill and Village this school year. I grew up not far from Pembroke in Auburn, NH and graduated high school from Pinkerton Academy in Derry. I spent this past summer going to concerts across New England, boating, practicing yoga, running, and teaching art at the Currier Art Center as well as in Pembroke for one fantastic week of art camp. Life is GOOD! Please feel free to leave me a question, comment, or email anytime!